The software definable GNSS core enables simultaneous reception of all commercial GNSS signals in the 1560-1610MHz frequency range. It contains all the RF, IF, analog, data converter and power management circuitry for a complete GNSS core in a low cost CMOS 180nm process. The core includes clock generation circuitry for a configurable 2/3 bit converter which also provides a low jitter clock source for SoC applications. The configurable core can receive the traditional GPS L1 frequencies as well as the GLONASS G1, Galileo E1 and Compass B1-1 and B1-2 bands. A configurable bandpass filter and variable rate A/D converter allows each band to be received separately in single channel mode or all bands to be received together for high precision applications. 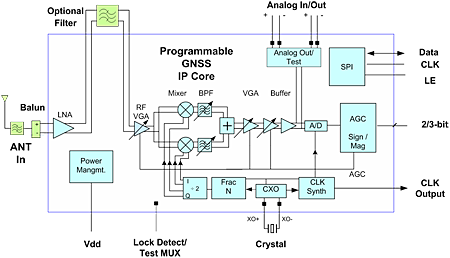 An integrated FRAC-N synthesizer can be configured for a wide range of low cost cellular crystal frequencies from 10MHz-52MHz.